While teaching the digital natives, teachers should know how to integrate latest and emerging technologies effectively in the classroom. But yes one of the secrets of effective teaching in 21st century is to balance conventional pedagogical procedures with the use of technology to nurture learning. Though, there are lot of technologies prevailing, in this article, we will discuss the importance of screencasting. The word “Screencasting” was first coined by Jon Udell- a columnist in 2005. He first used this word in a column published in InfoWorld. The article describes the advantages of utilising this technology to showcase readers how computer application functioned. Screencast is also known as video screen capture, often has audio narration. Screencasting is a quick and simple means to incorporate tech skills in any lesson or subject, while benefiting learners and teachers both. Screencasting can be incorporated in many learning activities and in curriculum. Screencasting technology can be used in teaching a new tutorial, demonstrating new thing, narrating power point presentation, digital story-telling, etc. Students gain strong understanding of the subject taught through screencasting. Struggling students or slow learners get individual attention for long, without disturbing other students or without teacher. Students rehear a skill properly, rather than re-enforcing their faults as they are not sure about the process. Present or future students grasp the lesson quicker. Over the web, you can find out a lot of platform or app that offers best features to screencast a lesson or presentation or demo; among all iXplain is a popular one. iXplain is a Windows 8 screencasting app that enables users to record presentations, lessons or anything that requires thorough explanation. The app records pen and your voice at the same time and users can use images on them to interpret. iXplain makes mp4 video file that can be shared via Facebook, You Tube, email or any social media. 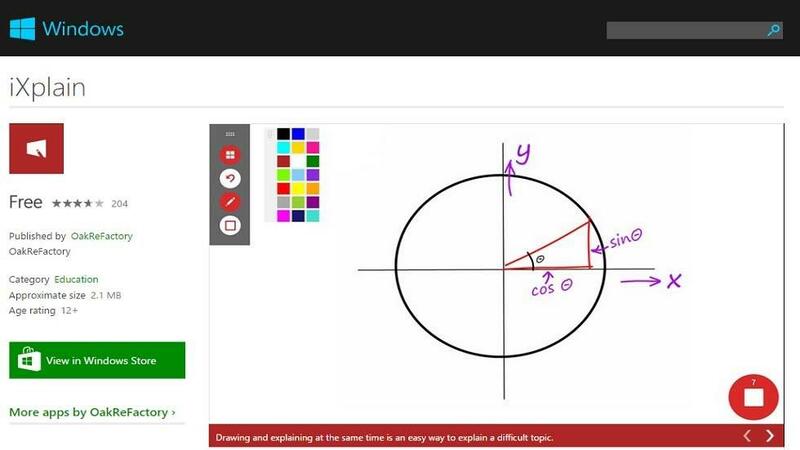 Create tutorial for explaining lesson or topics, flipping classroom. Illustrating new concepts, diagrams, explaining problems and giving solutions. Formulating strategies and showing problem-solving skills. You can download this app from here; as it is free to use. Users can also choose to buy a "Pro-Feature" is 0.99 EUR. Screencasting is very useful for educators who are keen to teach their students differently but with a personalized feel. Having screencasts from their teachers can solidify student’s knowledge base; it is a great tool for educators to utilise in the classroom for various learning activities.